Sometimes patience pays in the garden. It appears the pole beans have finally decided to start producing here. For the last couple of years we’ve had more beans than we could eat, but this year they have been very shy producers. Last week I actually got two nice harvests. One weighed a pound, and we cooked those up and ate them. The other was twice as big, and I processed those for the freezer. I’m growing Fortex, Gold Marie and Musica (same as last year), plus Trionfo Violetta and a couple of ‘greasy’ beans (Robe Mountain and Lazy Wife). All wound up in the harvest basket last week. It’s not likely to be our best year for tomatoes either, though we’ve had enough for processing and eating. One of the best slicers has been the Chef’s Choice Orange. This 2014 AAS winner was developed from the heirloom Amana tomato, and it’s my second year growing it. Celebrity, Early Girl and Better Boy have also done well, and they remind me why I always grow a few plants each year of these dependable hybrids. The o/p slicers have done terrible this year, and have basically given us nothing. I have fond memories of how they have done in past years, but I can’t put memories on a sandwich! I can (and did) put both Chef’s Choice Orange and Celebrity on sandwiches in the last couple of weeks, including the BLT on Whole Grain Bread in the below photo. I actually found a few leaves of Slobolt lettuce for that one, though that was the last of the summer lettuce. Doing much better than tomatoes are the peppers and eggplant. I harvested a ripe Flavorburst bell pepper and a couple of Jimmy Nardello peppers to use in a bean salad. Many of the peppers are starting to ripen now, and we are surely enjoying them. Another bell pepper that colored up early for me is Orange Blaze, a 2011 AAS winner. 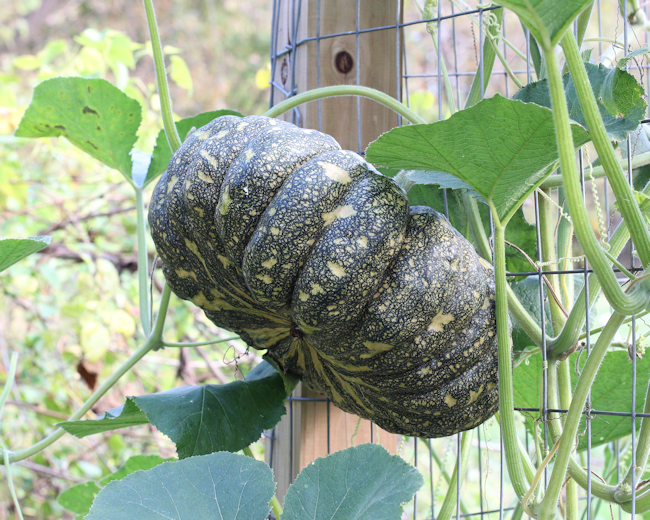 Something else we have enjoyed is the Honeyboat Delicata squash. I lost a few of them to rot, but the ones we did harvest have been exceptionally sweet and tender. This is my first time growing this variety, but I will plan on growing it again next year. It has a copper colored skin instead of the usual cream color most varieties of delicata squash have. One of my favorite things to do with the delicata squash is to cut it into slices, toss with a little olive oil and bake until crisp. The Honeyboat is especially tasty prepared this way. It made a nice accompaniment for some planked salmon we had for dinner one night. I harvested all of the Bush Delicata squash too. It seemed to hold up better to the wet conditions we had in July than the Honeyboat, though I’m not sure why. The plants are all gone, but that is usual for them here. The trial planting of tepary beans has been blooming and setting pods. Since I’ve never grown them before, I have no idea now long the pods will take to mature. Considering we are 60 days away from our usual first frost, I believe they will make it. You can see the beans beginning to swell in the pod in the below photo. Also in the ‘patience pays’ department, the first Thai Rai Kaw Tok squash is setting on. The first female bloom was quickly followed by at least two more. They are all on vines hanging off the fencing that goes around the outside of the main garden area. That was where I found most of them last year, and I was harvesting the last of them in late October. I hope you have enjoyed seeing a bit of what’s going on here in late August. To see what other gardeners are harvesting and cooking up, visit Daphne’s Dandelions where Daphne hosts Harvest Mondays. This entry was posted in Gardening and tagged Delicata, Monday Recap, pole beans, tepary beans, Thai Rai Kaw Tok, tomatoes. Bookmark the permalink. Beautiful collection of beans, like your treatment of delicata squash, am copying your baking idea. Didn’t grow any but will get some from the farmers’ market. Has been a strange year. I’m growing the same beans and got very little this year because of disease, which is usually not a problem. I swore off the OP heirloom tomatoes this year but did plant one, a Pruden’s Purple, which has given me three tomatoes so far and still looks healthy. I figured if I want a big heirloom slicer, I can always drive to the farm stand and pick out a couple nice ones. Let them take the risk. It’s interesting that the tepary beans are doing so well, I would have thought that they would be less tolerant of all that rain than the common beans. It’s nice to have your patience rewarded, it’s hard to imagine a summer without homegrown snap beans. Same goes for tomatoes. The roasted slices of delicata squash are what enticed me to grow it for the first time ever this year. I had some last year at a party and it was so good that I had to grow my own and try it. How long do you let your squash cure before you start using it? Carol Deppe recommends 4 weeks before eating the Candystick Dessert delicata. I used the Honeyboat shortly after harvest, since I was using some squash with bad spots. Normally I would let it sit for at least a couple of weeks. I am surprised about the tepary beans progress too. Apparently even though they may be drought resistant, they can take wet conditions too. We had over 14 inches of rain in the two months since I planted them. If I recall, you had an impressive bean harvest last year, long into the season! Hopefully they pick up soon for you. And what a nice batch of delicata. I’d like to try them again, but geez, so many varieties, so little space! But I sure would like to try that Thai Rai squash for sure if I can find seeds. That’s a nice assortment of pole beans, and the tomato is very attractive. Patience does pay, but it’s so hard to follow! Strange…I did not see that you linked to Daphne’s page. It really has been a strange year for gardening. My bush beans pretty much died off all in one week after second flushing was picked, but the pole are like on steroids. I can’t pick fast enough. Love your delecata squash and hope Thai Rai Kaw Tok will have enough time to ripen. That is a beautiful collection of Delicata squash. Have you noticed whether they’re bothered by vine borers? I’ve grown them before and only got a couple fruits way back when. And that’s so smart growing hybrid tomatoes just in case. My heirloom tomatoes did terrible this year and I planted more than 4 dozen plants.